So, David Tennant's leaving Doctor Who. On the one hand, I'm disappointed that he's not staying on for Moffat's tenure. On the other.......eeeee, regeneration! Casting call tiem nao! 1. Richard E. Grant. Yep, number one on my list (big surprise, right. ;p). He can play Eleven like he did in the Moffat Comic Relief skit, or Shalka!Doctor. I DON'T MIND EITHER WAY, BASICALLY. 2. Bill Nighy. No brainer. Apparently RTD ruled him out because he's over forty, but it'd be a great change to have someone older in the role. I think he could handle all the running and hopping, no problem. 3. Eddie Izzard. Eddie's third on the list, largely because while he would be awesome, I don't find it very likely that he'd do it. Still, his US tv show just got cancelled, so definitely maybe? 4. Stephen Fry. Yeah, this is in the 'not gonna happen in a million years' category. :( BUT IT WOULD BE AMAZING IF HE DID. 5. 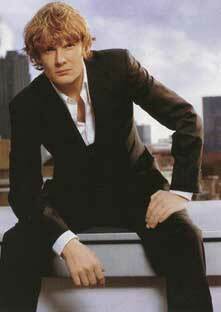 Julian Rhind-Tutt (linking a pic because some of the Whovians on the flist might not know him). I doubt that Eleven's going to be ginger, but if he is, I want this guy to play him. Look how enormously pretty he is! And if it isn't any of these guys, it'd be nice if it was an actor who doesn't have an instantly recognizeable face/name. David Tennant was still reasonably obscure when he was announced as Ten, so it'd be cool to give another actor that opportunity. There's big money on The Moz apparently! I'd be pleased with him too, but I left him off my list because he's in this year's Christmas special, and he's rumoured to be playing a Victorian con artist who's impersonating the Doctor. But then they recycle actors all the time in this show, so you never know! Comment by Yeah well, maybe next time, you will estimate me. Bill Nighy! I need more Bill Nighy in my life!